Topics: Election, Weird World, and School Reports. 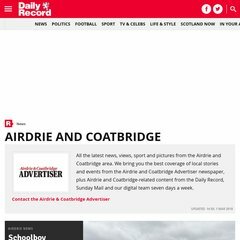 acadvertiser.co.uk News in Lanarkshire, Airdrie, Coatbridge, Baillieston - A & C ..
acadvertiser.co.uk Airdrie and Coatbridge news, news in Airdrie and Coatbridge .. The estimated 281 daily visitors, each view 1.50 pages on average. It has 2 DNS records, alycidon.firstnet.net.uk, and ballymoss.firstnet.net.uk. It is hosted by Manc Vault (England, London,) using Apache/2 web server. Its IP Number is 62.44.69.197. PING icnetwork.co.uk (62.44.69.197) 56(84) bytes of data.